Today we launch a new feature at Greater City Providence, Art Scene Lately. Margie Butler joins us as a guest arts contributor sharing updates on what’s out there in the city’s galleries and arts exhibitions. Art in Providence is alive and accessible and affordable. We’re interested in talking more about how art and our urban fascinations overlap. If I tallied up all the reasons I get out to explore new places, art probably tops my list. This weekend was perfect for playing art catch up — checking out several exhibits whose openings I missed. First was De/Construct II at 150 Chestnut in the Jewelry District. This group exhibit is curated by artist Allison Paschke in her loft space before she began demolition (What a good way to make something of her window of time and raw space). All of the works in this show are site-specific and relate to the theme of architecture. The show’s 19 artists take many approaches and a definite dialogue exists between the pieces. De/Construct II also gets you up to the 7th floor of a prime Jewelry District building. I point this out because I tend to walk through these blocks weekly, getting high above the sidewalk offered a rare glimpse of the real potential of one of cities unfinished corners. This exhibit is up through April 12th with daily hours 12-5 (closed Mondays). When I went Allison was there herself and at other times artists are sharing the gallery coverage. The street level door is clearly marked with instructions on how to call up to the loft and have someone come down to take you up on the key elevator (bring your cell phone). Next stop was 5 Traverse located on its namesake street just off Wickenden. This was a gallery way back before it went through a series of hat and fashion retail incarnations. 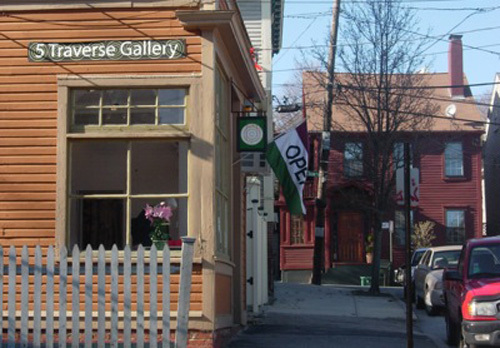 5 Traverse is an endearing, compact art space that keeps rolling out strong shows and packs in throngs of people during their popular openings. Usually 5T shows feature two artists – one in the main room and the other in the adjacent renovated garage bay. Venturing into this gallery always delights me — the art is impeccably presented, often fun and affordable enough that I think about purchasing it if I get that tax refund. Finally, I did a loop around downtown. I did this Sunday at 5pm knowing I wanted to see more of the current batch of Providence Art Windows. For once my timing was good as openings at both of AS220’s gallery spaces on Empire and Matthewson were in gear. While I walked into and by these spaces I was buoyed by the critical mass of people out doing the same thing|taking in art and spending time downtown on a weekend afternoon. This weekend of exhibit catch up assures that art will stay at the top of my list. Margie grew up outside of Hartford, Connecticut at a time when families frequently ventured downtown for culture, classes, and shopping. After living in New York and working as a consultant for over a decade Margie migrated east landing first in New Bedford where she ran that city’s downtown cultural economic development project AHA! Since 2004 Margie has lived in Providence on the East Side and consulted in marketing and the arts. Margie is interested in how creative cities can take a more authentic inside-out approach to presenting the arts across neighborhoods and genres. Thanks for the arts rundown! Thanks also for mentioning the 5 Traverse space. I’ve often heard people talk about what’s there, but not the space itself, which I really love. I also didn’t know it was a gallery before it was the hat/fashion store… Good to know the history! 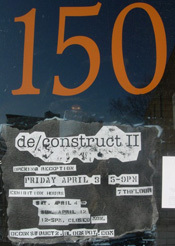 Good News – DeConstruct II will remain open one more week (April 13th-19th) by appointment. email or call first.